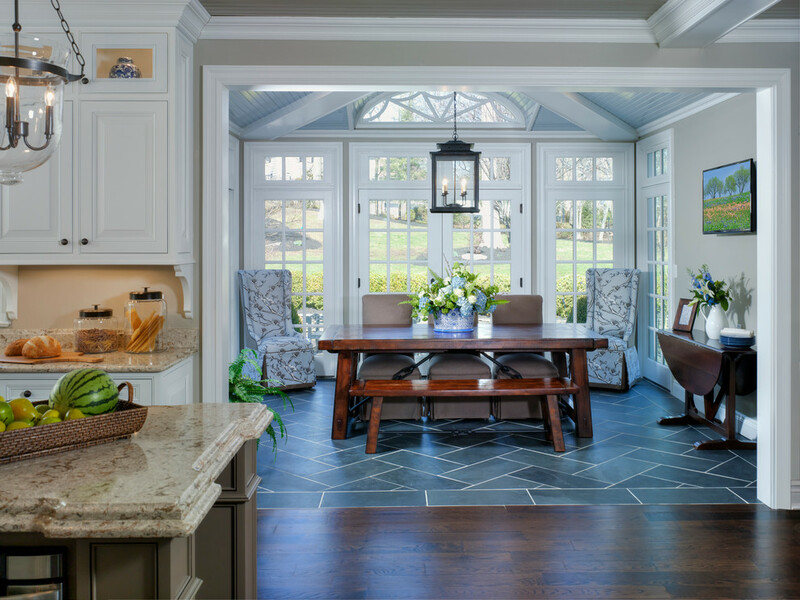 There comes a time in every homeowner's life when they are faced with how to mediate a transition from one flooring material to another: from carpet, laminate or engineered hardwood, to tile or natural stone. 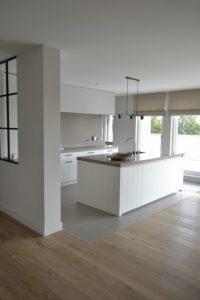 If remodeling by sections and not doing an entire ground-up tear-down or starting with new construction, there will often be different floor-heights for each material to handle in addition to the basic decision about how to visually "end" and cap material A, and start material B. Foremost a design aesthetics issue, this is also a functional issue. Achieving a same-height or "flush" transition between materials requires pre-planning and possibly extra construction expense. 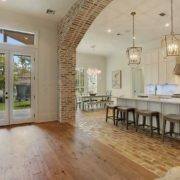 If additional construction isn't an option, planning and decisions will still be required in deciding what kind of "sloped transition strip" or "threshold" will mitigate your transition. With a little creativity and planning discussions with your installer, you should be able to pleasantly solve any transition problem! When transitioning from one material to the next, thought must be given to the scale and directional relationships of each material. 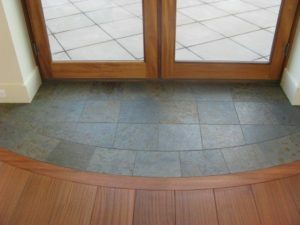 Doorway thresholds also need to be considered keeping in mind the appearance when seen from from either side of a closed door. 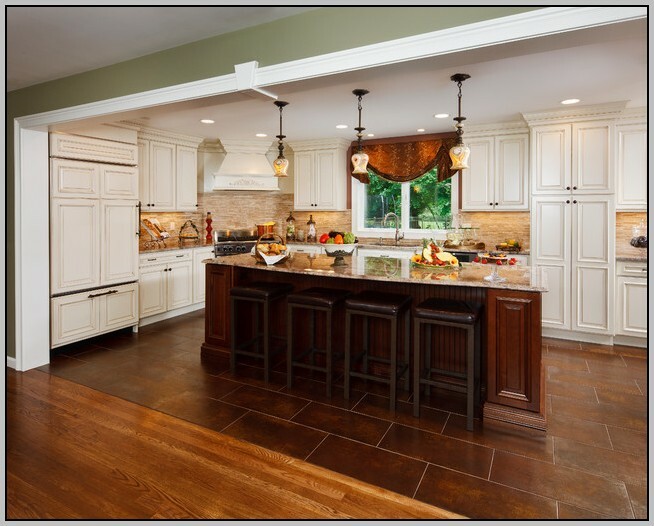 If hardwood planks lie perpendicular to a tile floor (short, cut ends border the tile), it's usually best to border the wood in its own material (1-2 rows depending on thin/wide plank width) before starting the tile. 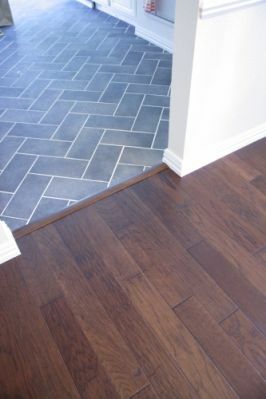 The wood border caps the cut plank ends, and also provides a continuous straight-edge border for the tile installation. Some people choose not to use a border to cap the cut plank ends if the adjacent material is large enough to function as it's own straight-edge in contrast to the cut planks. If the adjacent material will be set at an angle, it might also be decided that that material also include it's own border. 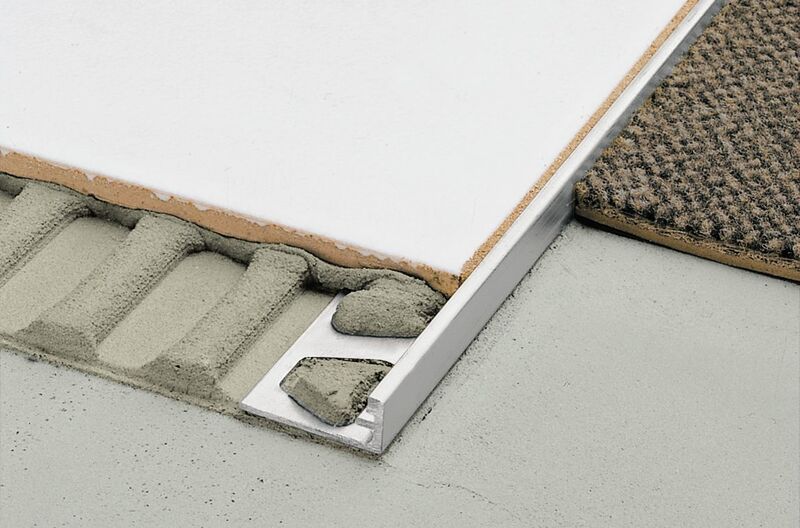 Some people prefer no emphasis (such as a thin decorative strip) between material borders and simply want to lay a low-profile bead of silicone caulk into the joint between the materials. You'll need long straight-edged borders to keep the emphasis off the joint or awkward short-cut edges of either material. If materials will be meeting each other at any kind of angle (i.e. 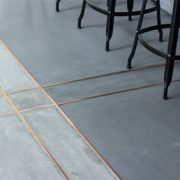 45 degrees), this installation will also require some kind of "straight edge break" border between the change in pattern or direction–even if continuing with the same material. 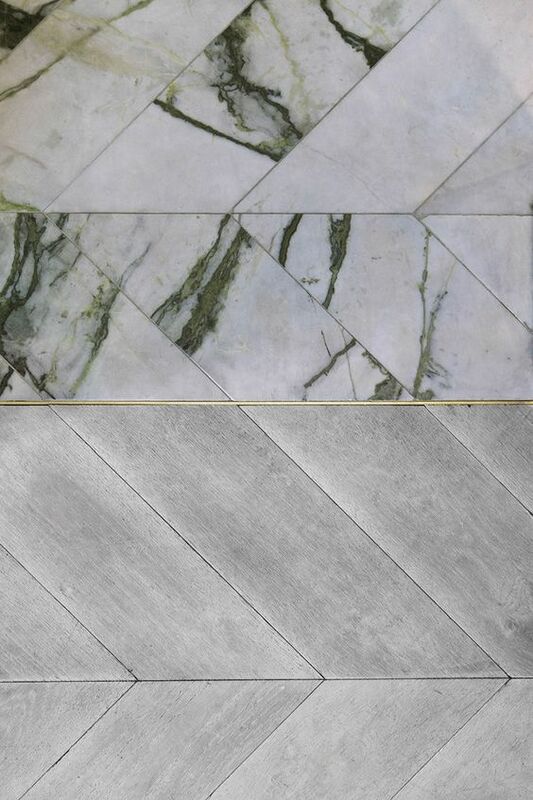 If a larger material meets a smaller material, or pattern change, the installation will usually require some kind of "break" between those materials and a change in pattern or scale–even if using the same material. In this case, the straight-edge border is usually created from the same material as the smaller pattern, in order to frame that pattern, unless a contrasted border is part of the design plan. 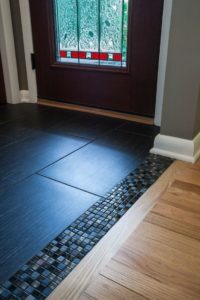 Using wide strips of mosaics or pebbles as a detailed transition border between materials is also a popular design approach. 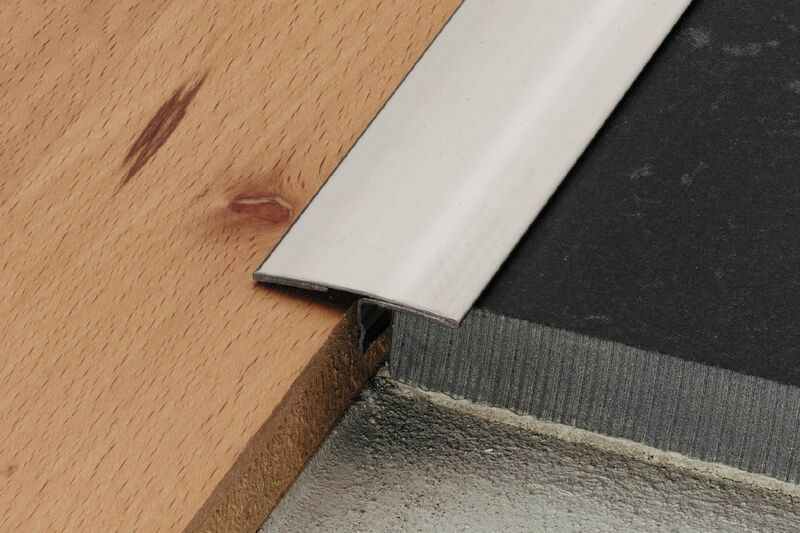 With the popularization of "Schluter" strips (which were created as a convenient tile transition strip, finish trim, or expansion joint application), intentional design applications evolved such as the use of the thin decorative metal profiles to add detail or function as a very thin border. 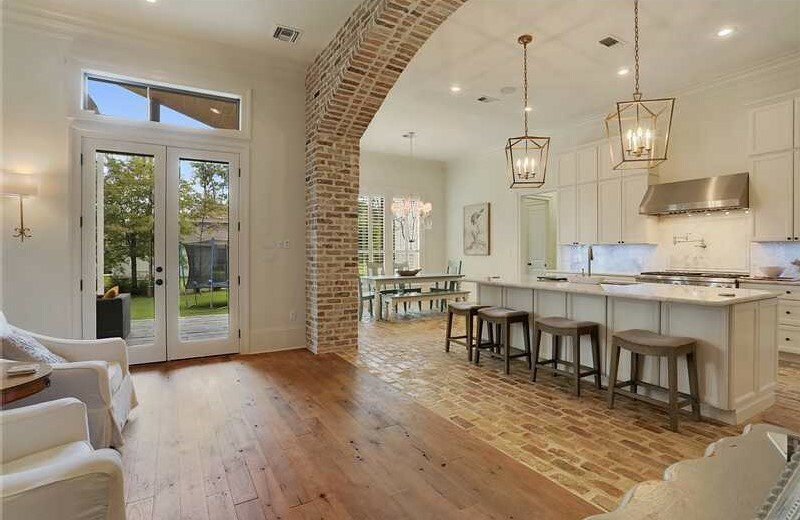 Doorways and arched entryways are natural points of transition, however pillars in open area floorplans provide a wider area to make a break. Just remember that if you make a drastic colorway transition, areas tend to appear broken off and make rooms feel smaller. 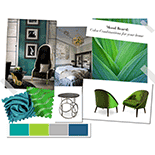 Continuing a colorway will help an area feel more expansive. The ideal transition is "same-height" or for each material to sit "flush" adjacent to one another. 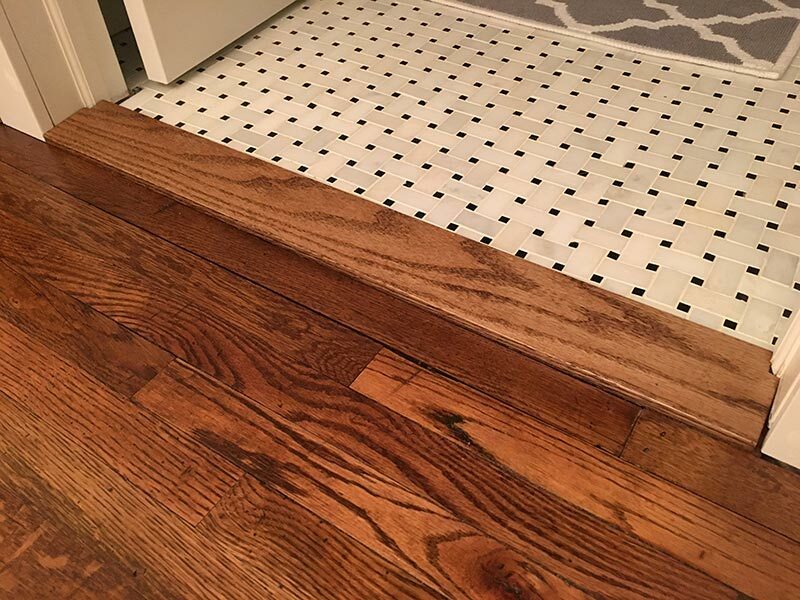 Often however, sloped transition situations cannot be avoided when remodeling and replacing only one section of a material (such as carpet or lineoleum) with tile. 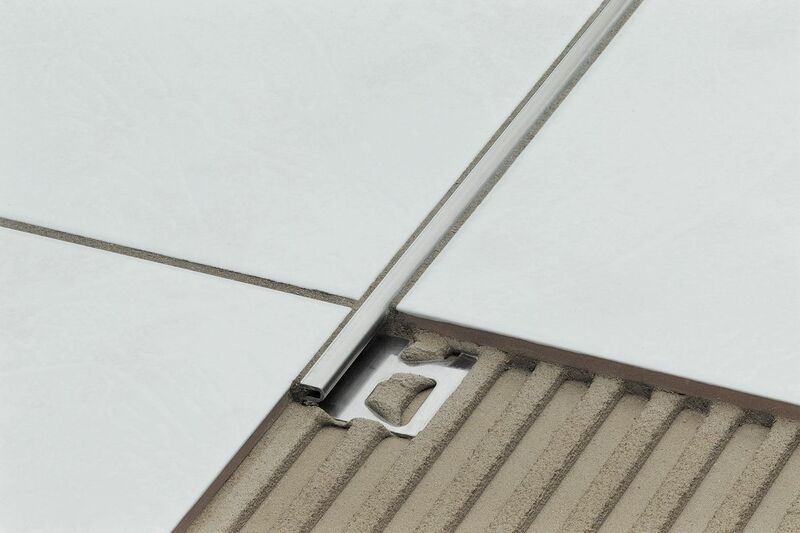 Tile plus thinset and underlayments often make tile higher than adjacent installations. 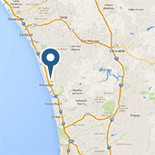 Most of today's floor tile is ⅜ inch to ¾ inch thick. 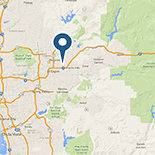 Most hardwood flooring is ¾ inch thick. 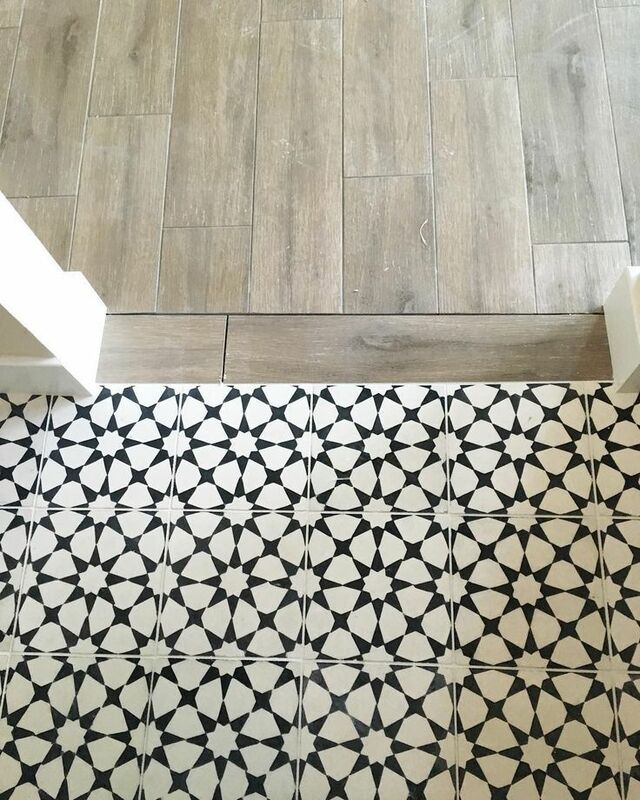 This means that when you put tile next to hardwood flooring, there will be resulting floor-height differences to mediate. 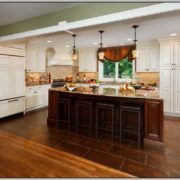 Often, tile is thicker than most other types of flooring and even varies in thickness from one type of tile to another. 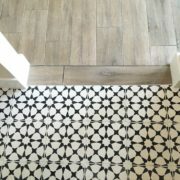 The mortar used to set the tile, will also raise the overall height of your tile floor –sometimes even by half an inch. There are a handful of solutions to this problem. 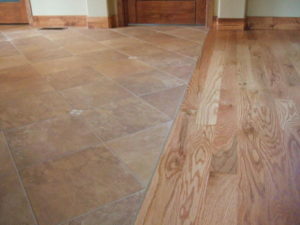 Floors can be "built-up," but they cannot be "lowered" without additional labor and expense. 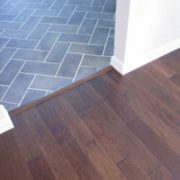 When you are working in an area where you can control the “when” of the installation, it is always best to install hardwood before you worry about the tile. This is because wood installations have a very definite thickness; usually just that of the wood itself, and maybe padding if it is included. Tile installations, on the other hand, require underlayment and various levels of mortar. As a result, it is generally much easier to make up for and adjust a height/thickness variant within the levels of a tile installation. If not, you can pad the wood floor with a layer of wood underlayment or layers of plywood as needed to bring the two surfaces level. 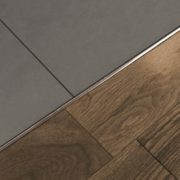 Part of matching the tile to the wood floor is ensuring that the thickness of the underlayment is taken into consideration. 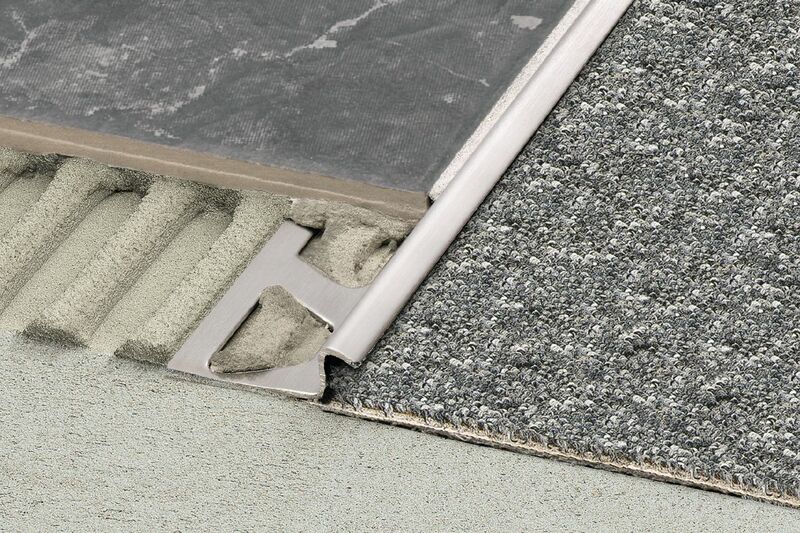 You can use either fiberboard or a cement board; wood underlayment is never acceptable with tile installations. 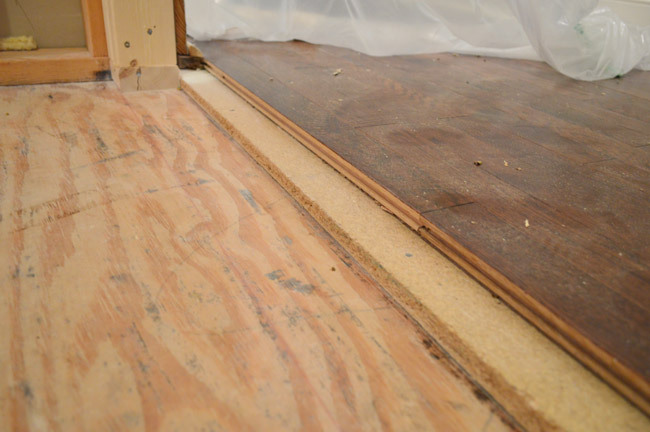 These boards are commonly sold in 1/4-inch and 1/2-inch thicknesses and are mortared as well as nailed into place on top of the existing wooden subfloor for the home. 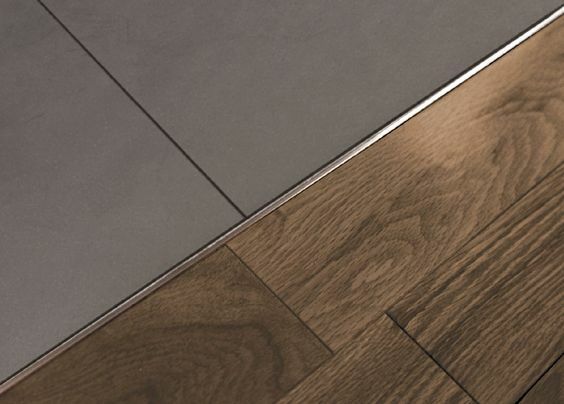 You only need a 1/4-inch layer, but the inclusion of up to 1/2-inch thicknesses allows you to build up the floor under a tile installations so the finish face of the tile is flush with the hardwood. 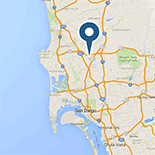 Most man-made tiles are around 1/4 to 3/8 inch thick. This is easily checked when you are ordering material. 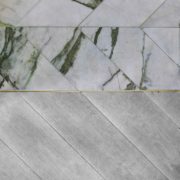 Natural stone tiles, on the other hand, are much more difficult to work with as rough stone surfaces vary in thickness. 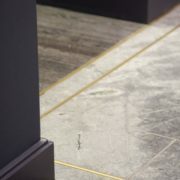 Raw slate, for example, can range from 1/4 to 1 inch or so in thickness depending on the variance in the stone when it is sheared/cut into tile-sized sections. 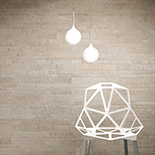 However, even man-made tiles can be thinner, such as with 2-by-2 mosaic material. 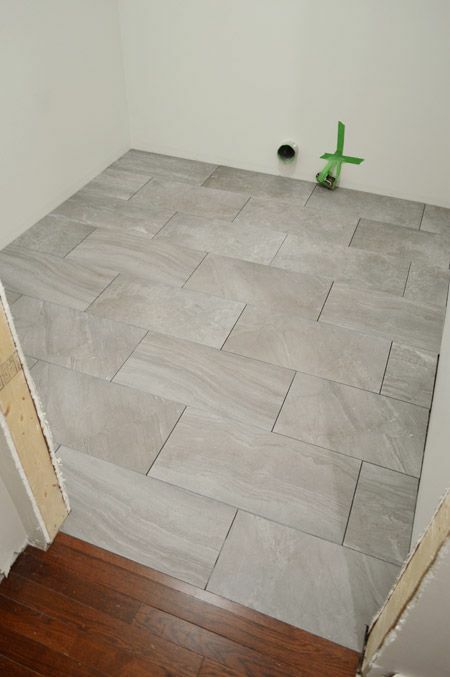 Always check first to see what the thickness of your tile is and add that to the underlayment and thin-set layers. 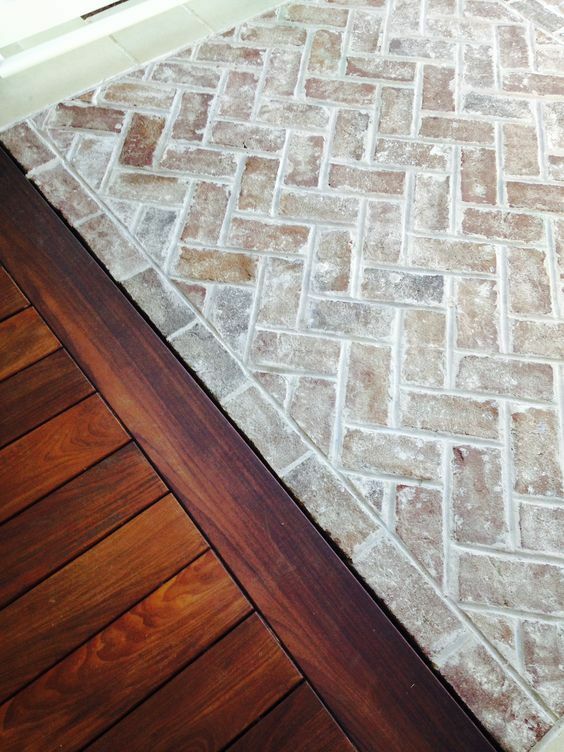 There are two levels of thin-set mortar included in tile installations. The first is on top of the subfloor under the underlayment for the tile. This is normally applied with a 1/4-inch notch trowel. After compression, the thin-set layer is around 1/8 thick. The same rule applies for trowels up to 3/8 inch in size for the application of tile. Larger trowels, such as 1/2- or 3/4-inch notched trowels, leave behind a significantly thicker bed of mortar, up to 1/4 inch for the largest tiles. 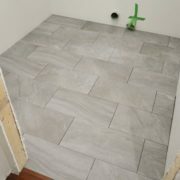 If you are working on a standard 12-inch tile with a standard 3/8-inch notched trowel, you can expect a 1/8-inch layer on top of the 1/8-inch layer under the underlayment, for a total height of 1/4 inch. 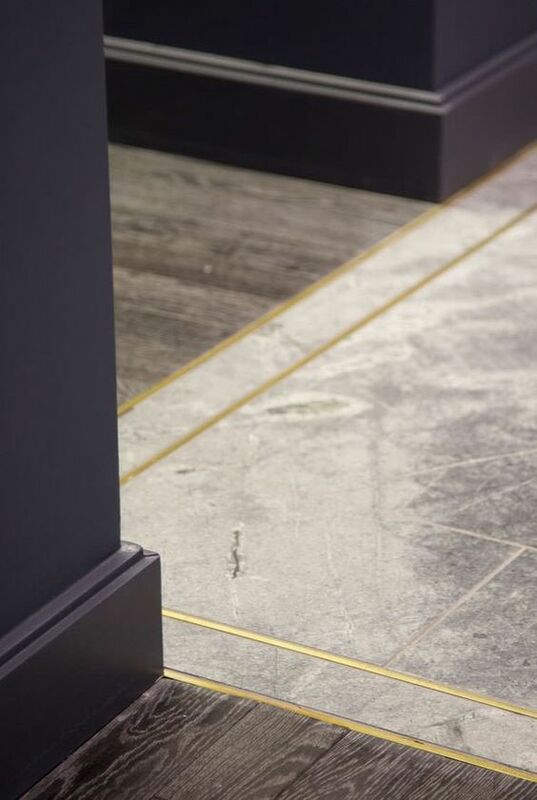 One of the downsides to working with natural stone is that it is virtually impossible to match it up with the thickness of a uniformly cut and flat wood floor. 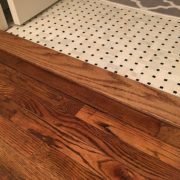 If you are absolutely set on using a specific material that is going to rise above the height of your hardwood floor when you include underlayment and thin set, your only option to flush out is a drop-down floor. This is a box area specific to your installation where the floor joists for that specific area are dropped lower than the surrounding floor. A custom bed of concrete mortar deck mud is then floated on top, around 2 inches thick, and the tile installed on top of this bed. This allows you to adjust the depth of the bed to accommodate for the material and flush out the tile installation to match the wood. 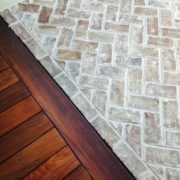 If you do not wish to build up your subfloor you can go with a decorative transition piece that is installed along with your new floor. 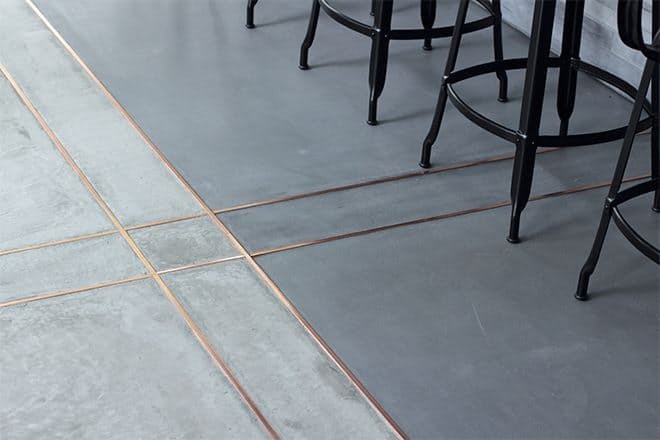 The decorative transition could either be a piece of tile that is at a slight slope to allow for the transition from one floor or room to another or could be a stainless steel or colored profile, such as those offered by Schluter. 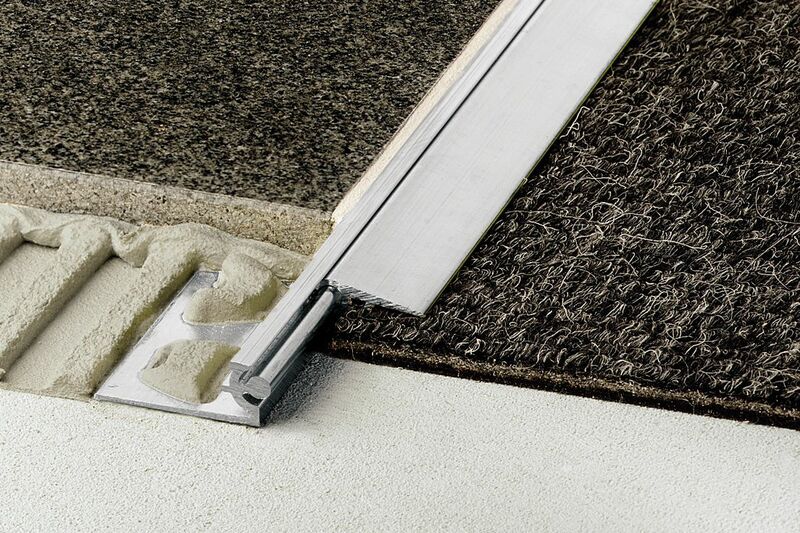 See the various transition solutions offered by Schluter for same-height or sloped transitions in the sections below. 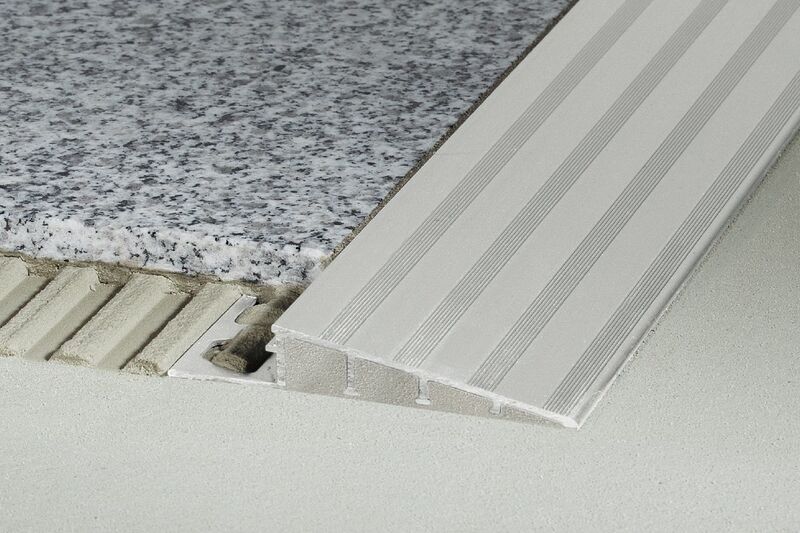 Schluter®-SCHIENE provides effective and attractive edge protection for tile coverings that are typically bordered by carpet, at expansion joints, or as decorative edging for stairs. 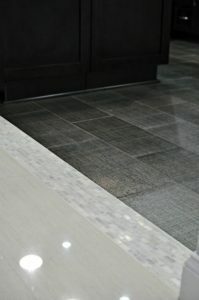 The profile offers a discreet, minimum reveal which is ideal for creating elegant transitions between floor coverings.